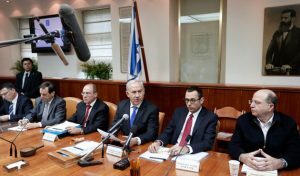 Israeli communication minister Sunday indicated that Tel Aviv will move to close Qatar-based Al Jazeera’s Jerusalem bureau, revoke journalists’ credentials and cut the channel’s satellite connection over what the cabinet calls incitement for violence following clashes between Israeli Security forces and Palestinians in Haram al-Sharif compound in Jerusalem. This is the second time in a short period of time that Israel threatens to shut down the bureau. Prime Minister Benjamin Netanyahu late last month indicated he would push for the channel’s Jerusalem bureau closure. “The Al-Jazeera channel continues to incite violence around the Temple Mount,” he wrote in a Facebook post, referring to the Haram al-Sharif compound in Jerusalem, known to Jews as the Temple Mount. Communication minister Ayoub Kara pointed out that he would engage the Government Press Office to revoke Al Jazeera journalists’ accreditations in Israel. Thirty staff members, mostly Palestinians, are in the eye of the storm. Kara also indicated that he had asked Internal Security Minister Gilad Erdan to use his powers to close the channel’s offices in Israel, although a spokesman for Erdan said he doubted the minister had the authority to do so, Middle East Monitor (MEMO) reports. “Our ministry is not the address. Try the police,” spokesman Daniel Bar said. An unidentified Israeli official from Netanyahu’s office indicated that Al Jazeera has fallen in the category of media inciting violence which the cabinet will not tolerate. “The Prime Minister is not too pleased with the constant incitement that you see and hear on Al Jazeera, a lot of it in Arabic. There is a lot being broadcast on that channel that is frankly dangerous,” the official said. Israel has backed Saudi Arabia, United Arab Emirates (UAE), Bahrain and Egypt in their stand against Qatar accused to using Al Jazeera to incite unrest and revolutions in Arab countries. The bloc issued a list of 13 conditions including closure of the news channel that they have already banned on their territories. Written by: KanelkaTagba on August 7, 2017. Posted by KanelkaTagba on Aug 7 2017. Filed under Headlines, World News. You can follow any responses to this entry through the RSS 2.0. Both comments and pings are currently closed.